Beans are susceptible to many viruses; the most important are Bean Common Mosaic Virus (BCMV) and Bean Yellow Mosaic Virus (BYMV). 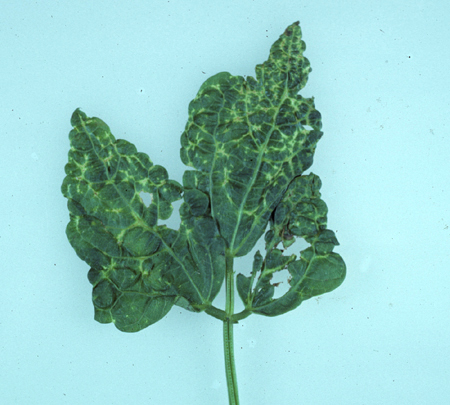 BCMV causes mosaic and lesions on foliage as well as blackened roots. Several different strains of BCMV are recognized; symptoms and host range vary by the strain. BYMV also exists in many different strains and symptoms are easily confused with BCMV. BCMV can be seed-borne and is transmitted by at least 12 species of aphids in a non-persistent manner. BYMV is not seed-borne and is spread in a persistent manner by more than 20 species of aphids. Disease outbreaks are often associated with the presence of virus source plants such as sweet clover, white clover, crimson clover, and Gladiolus species. The virus overwinters in clover and vetch; beans should be planted at least 800' from these legumes. Substantial loss of yield can result if an entire planting becomes infected. Resistant varieties are available for both BCMV and BYMV and constitute the most reliable means of control. Purchasing certified, disease free seed is an important disease management tactic for BCMV. Seed treatments, insecticides, and roguing of diseased plants are of little value for BCMV. Insecticides applied preventively and early can reduce BYMV spread. There are no cures or chemical treatments for plant viruses.